The US has rejected a new initiative by Uruguay and Mexico to restart dialogue in a bid to de-escalate the political standoff in Venezuela. A senior US official cited by Reuters said that countries would “ultimately see it is in their interests to recognize” self-proclaimed “Interim President” Juan Guaido. Washington’s position was echoed by Carlos Vecchio, appointed by Guaido as charge d’affaires in Washington DC. On Wednesday, the governments of Mexico and Uruguay announced an international conference set to take place in Montevideo on February 7. According to a joint statement by both countries, the goal of the conference is to “establish a new dialogue mechanism” that will contribute to “peace and stability” in Venezuela. “Both governments [Mexico and Uruguay] have adopted a non-interventionist position. […] For that reason they have decided to call for a inclusive dialogue to solve the delicate situation in Venezuela once and for all,” the statement continued, before adding that more than ten countries and international bodies have already signed up. European Union High Representative for Foreign Affairs Federica Mogherini, who had previously expressed tentative support for the dialogue initiative, announced on Thursday that the EU would lead an international contact group with a 90-day time frame, with the aim of getting Venezuela to hold new elections. France, Germany, Italy, Spain, Portugal, the Netherlands and Britain have signed up from the European side, while from Latin America, Ecuador, Costa Rica, Uruguay and Bolivia have confirmed their participation. Britain, France, Germany and Spain had previously threatened to recognize Guaido if new elections were not called within eight days, and the European Parliament approved a non-binding statement on Thursday urging EU governments to consider the opposition lawmaker as “the only legitimate interim president.” However, the bloc as a whole has yet to to adopt this position. Meanwhile a report in El Pais on Friday contained stark revelations regarding US influence over Spain’s Venezuela policy. According to the paper, the Trump administration pressured Spain not to move forward with dialogue initiatives and alerted Madrid of Guaido’s self-proclamation in advance. The report also brought to light disagreements within the Spanish government over recognizing Guaido, with the Foreign Ministry reluctant to take such an unprecedented step, while Prime Minister Pedro Sanchez was eager to follow Washington’s lead in order to avoid attacks from right-wing Spanish parties. Spain’s eight-day ultimatum came after US Ambassador to Madrid Duke Buchan III met with Spanish Foreign Minister Josep Borrell and demanded that his government immediately recognize Guaido and abandon any dialogue channel with the Maduro administration. “We are under a lot of pressure – I’m not going to tell you from whom, but you can imagine – to vote against the creation of this [dialogue] group,” Borrell said in reference to the latest dialogue initiative. “The US is convinced and has let us know that there is no more room for mediation,” he added. For their part, Venezuelan authorities have rejected the eight-day ultimatum from European countries, with Foreign Minister Jorge Arreaza stating that Caracas would not accept deadlines set by foreign powers. Juan Guaido swore himself in as “interim president” after an anti-government rally on January 23. He was immediately recognized by the United States and right-wing governments in Latin America, and later by other countries such as Australia and Israel. US President Donald Trump spoke on the phone with Guaido on Wednesday, congratulating him for his “historic assumption of the presidency.” US authorities significantly increased the economic pressure on the Maduro government on Monday by levying new sanctions that amount to an effective oil embargo and freezing Venezuelan assets held in the US such as Citgo, subsidiary of state oil company PDVSA. National Security Advisor John Bolton stated that these measures would deprive the Venezuelan government of US $7 billion worth in assets and cost around $11 billion in lost export revenue in 2019. Torino Capital Chief Economist Francisco Rodriguez has predicted that Venezuela’s economy will contract by an additional 15 percentage points as a result of the new sanctions, on top of the 11 percent decline already anticipated. President Nicolas Maduro criticized the “illegal, unilateral measures” and the attempts to “steal” Citgo, stating that Venezuela will take legal action to defend its national assets. 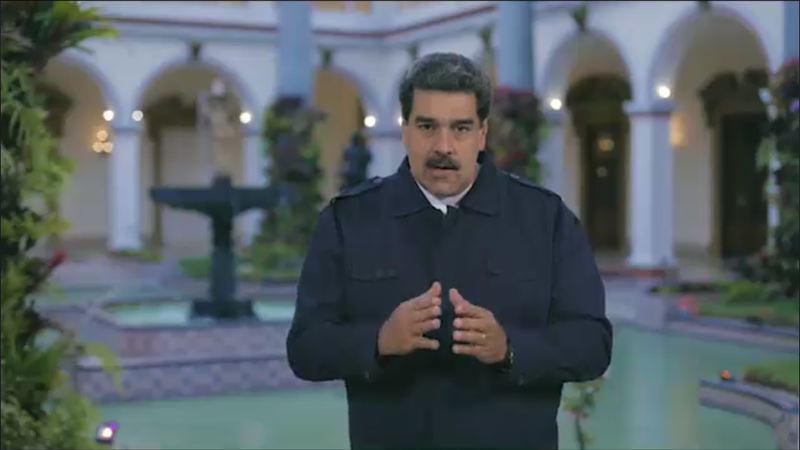 Maduro also published a video on social media addressing US citizens, urging them to stop Trump and a “group of extremists around him” from creating a “Vietnam” in Latin America. Maduro went on to express his admiration for US history and his desire for close, respectful relations. “The US is so much bigger than Donald Trump,” he concluded. Opposition leader Guaido had called for fresh protests on Wednesday. 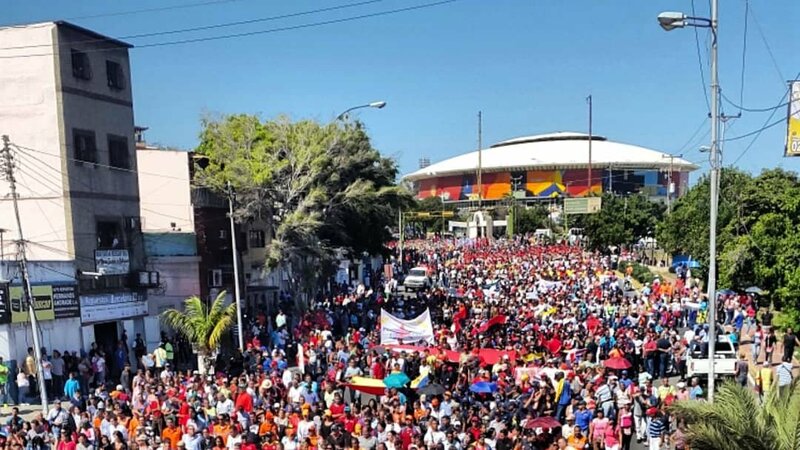 However, witnesses reported only small gatherings in the traditional opposition stronghold of east Caracas. Larger anti-government demonstrations are expected to take place on Saturday. Guaido headlined a “Plan for the country” (“Plan País”) conference held at the Central University of Venezuela in Caracas. The plan was conceived by several parties of the Venezuelan opposition in late 2018, including as some of its main points the dismantling of state regulations, accessing loans from multilateral bodies such as the IMF and allowing private capital to hold majority stakes in public companies and oil projects. During his presentation, the opposition lawmaker claimed that members of the Bolivarian Police’s special forces division (FAES) had staked out his wife’s house to intimidate his family. However, FAES officials denied that any such operation had taken place. Independent journalist Roman Camacho reported that four individuals dressed in black identified themselves as FAES upon arriving, and left shortly afterwards. The Venezuelan Supreme Court, following a request by Attorney General Tarek William Saab, had ordered a freeze of Guaido’s assets and a ban on leaving the country on Monday, while probes into his recent actions take place. A Chavista demonstration has been called for Saturday along Caracas’ iconic Avenida Bolivar. Venezuela’s Interior Minister Nestor Reverol also announced on Thursday that several “mercenaries” had been captured by security forces. According to Reverol, interrogations revealed links to the Venezuelan right-wing and plans to assassinate selected political and military leaders. Some suspects were allegedly caught travelling in a vehicle with false FAES insignias. Retired Venezuelan military officials are among those arrested, including a retired colonel wanted for alleged involvement in the August 20 assassination attempt against Maduro. Edited by Lucas Koerner in Caracas.